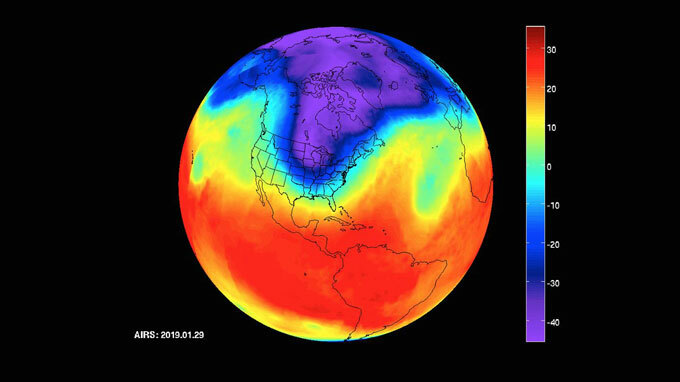 The late January deep freeze across much of the U.S. offers a valuable 'teachable moment' for media: Polar vortex heightens risks from climate change. “Extreme cold in the U.S. and extreme heat in Australia – all due to climate change” (The Irish Times). Some media framing was problematic, like that in Fox News that “some scientists argue that the Arctic warming is already having an effect on the polar vortex and jet stream” while “other scientists remain unconvinced.” That frame highlights disagreement over scientific consensus without explaining how the process of scientific inquiry works. Media clearly contribute to public understanding of climate change. But in some cases they do so – or try to – in the context of journalistic norms of objectivity and balance that continue to hinder evidence-based climate reporting. Research shows there are two types of climate journalists: prolific climate specialists for whom the beat is a regular assignment, as at digital-only outlets Inside Climate News and Carbon Brief. There are also those often known as “general assignment” or “GA” reporters who only occasionally cover climate change. These include, for example, most local reporters and business correspondents. Media and others involved with informing the public about the warming planet will do well to consider whether asking if climate change “caused” the extreme cold is simply the wrong question. A growing field of research among climate scientists is addressing these issues through the field of climate attribution. A goal of this “extreme event attribution” is to parse out how much of the risk associated with an individual extreme weather event – or a class of events like heat waves or flood – is related to climate change versus random variability, according to the National Oceanic and Atmospheric Administration Climate.gov. “Climate change made 2018 European heatwave up to ‘five times’ more likely” (Carbon Brief). The broad scope and range of climate impacts clearly pose challenges for the large number of general assignment media and journalists who comprise the vast majority of those communicating on climate change for broad “general interest” audiences. All the same, a clearer understanding of what climate attribution can tell us, and what it can’t, can help improve both reporting generally and public understanding of the issue overall. Those in media “writ large” clearly need to expand their and their audiences’ understanding of what a climate change story is: Extreme weather stories are climate change stories. Reporters and those aspiring to be one should focus on the heightened climate risks associated with an increased likelihood of more frequent and/or more intense extreme weather events. Make the switch from uncertainty to risk framing. Focus on when, not if, climate impacts will occur. As the UK-based charity organization Climate Outreach advises, emphasize climate risks and what is known, rather than the uncertainty and the unknowns around the edges. Emphasize the overall scientific consensus. Research* shows that consensus messaging can reduce the gap between the perceptions of political liberals and conservatives. Use data effectively. Resources like those available from Climate Central can help. Redefine journalistic objectivity. Good climate journalism contextualizes viewpoints. It relies on the journalist’s “trained judgement” to verify and make sense of evidence. Tell human stories; especially ones about climate adaptation. Focus on local angles, emphasizing impacts on, and connections to, daily life. Report on different angles. Look at issues such as public health, business and financial developments, “clean” technology and innovation, public transportation and infrastructure, food systems, arts and culture, sports, religion and disaster preparedness. All of these and more offer angles for better and more responsible journalism on climate change. Choose better visuals. Climate Outreach recommends visuals that have emotional impact and show: real people, climate change causes “at scale” and local impacts. Media are key players in the infinite wheel of those needing to better tell climate change stories in all their sweeping and complex relevancy to daily life. To do that, journalists need to better understand climate attribution as part of more effectively reporting on climate change. That’s a charge facing all journalists, and not just environmental and climate “beat” specialists. Universities developing the next era of journalists are adding courses on climate change communication. Students’ future careers may not take them into climate journalism per se, but they’ll be better at reporting on, and talking about, climate change impacts as they inevitably will relate to whatever chosen field they pursue. Jill Hopke PhD is an assistant professor of journalism in the College of Communication at DePaul University in Chicago. She teaches climate change communication and researches communication on climate and energy issues. *Editor’s note: An author of this study directs the Yale University program responsible for publication of Yale Climate Connections.